I’ll be honest, I wasn’t particularly excited about making this month’s Baking Club bake. I know, it’s a terrible thing to say but it’s the truth. The box arrived a couple of days ago, conveniently dropping through my letterbox so there was no waiting around for it to be delivered. The first thing that I saw was the lovely bright new packaging… a beautiful green which made it stand out from the boring brown envelopes which arrived with it. I get really excited to open this box each month to discover what wonderful recipe I will be baking. 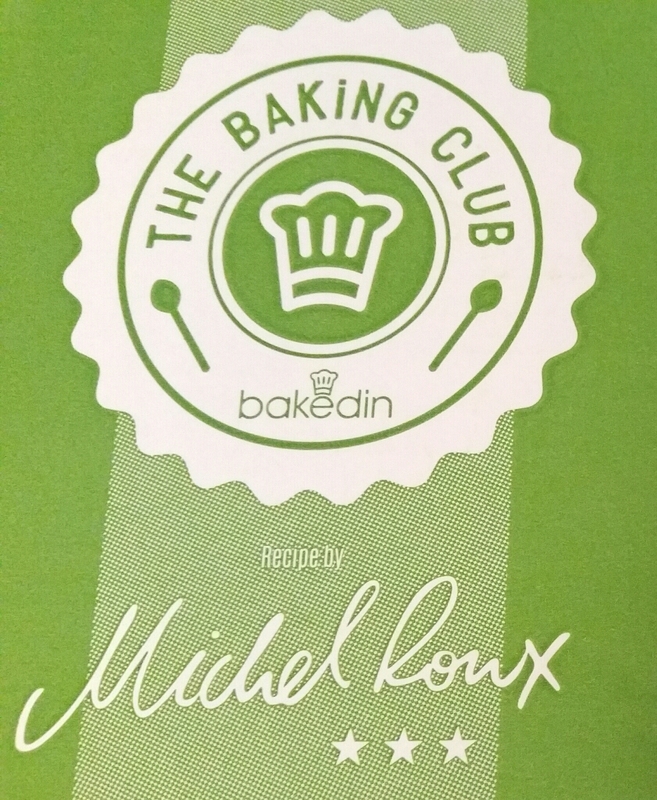 I am a huge fan of Michel Roux, so to receive all the dry ingredients I need to create one of his exclusive recipes is just a joy. I opened this box with my usual eagerness and after opening the lovely paper that the ingredients are wrapped in, I saw the one word I usually really don’t like… banoffee. I have a huge sweet tooth but I have never found a banoffee recipe of any description that hasn’t been disgustingly sickly and far too sweet. So, in all honesty, my heart sank a little when I opened this box. How silly was I? I should have known this would be different! After all, in all the time I have been subscribing to the Baking Club, there hasn’t been a single bad recipe. I can honestly say with my hand on my heart, these cookies are ridiculously scrumptious! The perfect amount of sweetness, not sickly at all, but bursting with flavour and texture. They contain fresh banana as well as dried banana chips for amazing flavour, and delicious fudge pieces for texture and indulgence. I like cookies to be chewy not crunchy, and these were perfect. Lovely and chewy and moist, with a little crunch from the dried banana on top. All finished off with a drizzle of white chocolate on top. They were delicious still warm from the oven, and they were delicious cooled completely. In a word… Heaven! 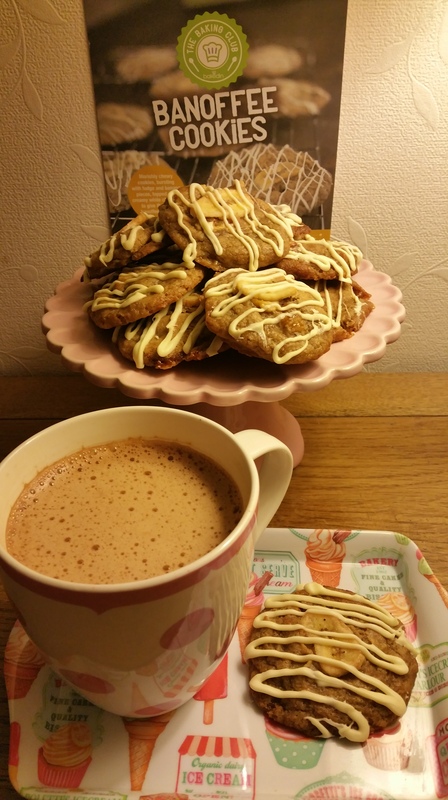 I have loved BakedIn Baking Club from the instant I received my very first recipe box, and this month I love them even more for introducing me to a banoffee recipe I can finally enjoy! I will be making these cookies again and again as we all really really enjoyed them. That’s the beauty of this Club. The recipes come with ingredients pre-weighed for you, but the recipe card clearly tells you how much of each ingredient you have so you can make them whenever you want to in the future too. I keep all my recipe cards from them in a folder so I know where to find them quickly. I cannot tell you the amazing recipe that I used to make these treats, as it is exclusive to BakedIn and it wouldn’t be fair. 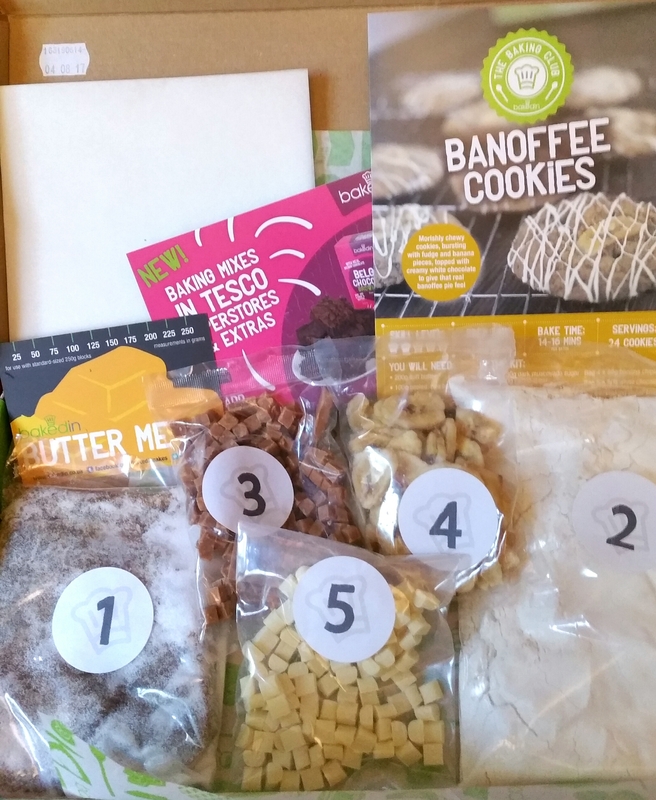 However if you would like to join the Baking Club and receive these fantastic recipe kits for yourself, click HERE to receive your first box for the incredible price of just £1.99! After that, it costs just £7.99 per month which includes postage. Well worth every little penny.